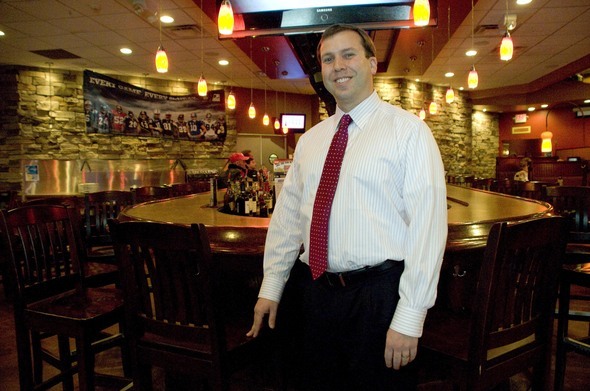 Posted on Fri, Oct 28, 2011 : 5:58 a.m.
Andy French co-owns Aubree's Pizzeria and Tavern in Ypsilanti Township. The Aubree’s Pizzeria & Grill in Ypsilanti Township, located at 2122 Whittaker Road, will be closed for five days next week for renovations and menu changes. The restaurant will close at 10 p.m. Oct. 30 and reopen at 11 a.m. Nov. 5. Renovations include a new sign on the building, changing the name from “Tavern” to “Grill," painting, removing carpeting and reconfiguring the kitchen. “We realized after polling some of our guests that the word 'tavern' didn’t exactly fit who we are or our brand,” said Andy French, Aubree’s CFO, in a news release. A new four-burner stove will also be installed in the kitchen, allowing the restaurant to offer different menu entrees, according to the release. The new menu will feature chicken parmesan, beef medallions and spaghetti and meatballs. “As a company, we are excited to see our new name on the front of the building and to be able to freshen up the interior for our guests,” French said. There are five Aubree’s restaurants in Michigan, including one in Ypsilanti's Depot Town and a new franchise in Dexter. The restaurant was approved by the state of Michigan to begin franchising in March 2011, and the owners hope to open several more franchises in addition to the Dexter location. Fri, Nov 11, 2011 : 4:39 p.m. Went last night. Food was good. It did take a while to get it but good nonetheless. Service? Bad. Hopefully that's not how the entire waitstaff will be. That girl needed to get some pep in her step! Sat, Oct 29, 2011 : 1:38 a.m.
Fri, Oct 28, 2011 : 9:04 p.m.
Fri, Oct 28, 2011 : 5:30 p.m.
Aubrees has been the highlight of our community! The service myself, my family, and my friends have received from the Whittaker Road store has been nothing but outstanding. It is sad how in the state of our economy and the decline of small buisnesses people will sit online and bash a place that is thriving. If you have service problems you should let them know, not broadcast it online like a immature teenager. Congrats to Aubrees &amp; keep up the great work! Fri, Oct 28, 2011 : 7:06 p.m. I have been a patron of Aubree's in Depot Town for over 20 years and the service is exceptional. I had one bad experience recently which shocked me. I hope it was just an off day for the cook and I will try them again. My burger arrived without any lettuce, tomato or onion which it usually does. I asked for blue cheese and I may have received a tablespoon at most. I have nothing but good things to say about the pizza at Aubrees. I just hope my recent visit is an anomaly and never happens again. Fri, Oct 28, 2011 : 5:29 p.m. I love their food. Yea, a bit pricey... but it keeps the riff-raff out. I had my first wheat crust pizza ever @ Aubrees II. Awesome. Fri, Oct 28, 2011 : 4:23 p.m.
Not a big fan of Aubree's: Several years ago I placed a delivery order out of this particular location. After about an hour of waiting for the delivery, I called and was told that my order was transferred to the depot town location because it was closer to my home. I called the depot town location...and they didn't have record of my order and I was redirected to the Whittaker Rd. location where I was finally told the truth that my order was cancelled because I live in an area where they refuse to deliver. I swore to myself that I'd never patronize them again, but this past June I thought to give them another chance by dining in-house for the first time. While my order was fine, my friend's calzone was prepared with the incorrect toppings. The server offered to have it replaced, but the excuse that we received was that they were so busy and these types of mistakes happen. &quot;Two strikes you're out&quot; is enough for me - I'm never returning. Remodeling won't solve the customer service problems. Fri, Oct 28, 2011 : 3:36 p.m. Sat, Oct 29, 2011 : 1:37 p.m.
Lindsay, they also have &quot;Gluten Free Beer&quot; at the Depot Town location. Be careful on the fries. Aubree's breads the fries and I am unsure as to if the oil used is also, used for other food. Fri, Oct 28, 2011 : 7:19 p.m. I'm sorry to hear that. I will have make sure to be careful in the future. I've only ordered the pizza a handful of times. I always remind them that my food cannot TOUCH others' food and they have to prepare it with clean gloves. Fri, Oct 28, 2011 : 4:26 p.m. I still get sick every down and then when I get their gluten free pizza. I think there is a lot of cross contamination. It's baked on the same oven that regular pizzas are made. And I doubt that their toppings are all gluten free as well. I was so sad. It was really tasty. Fri, Oct 28, 2011 : 2:51 p.m. I love Aubree's! I'm not sure what some of these other people are talking about?? We always have great food &amp; service there. I think some people you will NEVER please no matter what you do. Keep up the great work aubree's! I hope to see you in every city I visit. Fri, Oct 28, 2011 : 2:38 p.m.
By all means, let's slag a locally-owned Ypsilanti business on the internet. That is very helpful for everyone. (SARCASM). This is a very nice family restaurant. Fri, Oct 28, 2011 : 1:33 p.m.
Fri, Oct 28, 2011 : 5:07 p.m.
Fri, Oct 28, 2011 : 2:30 p.m.
@thomas, have you seen what the 'chains' charge for a burger? even calling it a 'gourmet' burger? i'd rather pay that and support a local establishment, even if they have been approved for chain-hood. (btw, yes, $9.99 is getting ridiculous for a burger). you're talking what couple bucks for actual product cost. ? how about $2.50 for a soda, when it's a $.05 worth of syrup? Fri, Oct 28, 2011 : 2:11 p.m.
$9.99 burgers are getting ridiculous. The wife and I just spent $38 in Depot Town for two burgers and two beers and the burger was the worst one I had there in 20 years. I hope it was a fluke because I really enjoy eating at Aubree's. I would like to see a burger and beer special for $5, it can be done because several restaurants in Dearborn have that special. The pizza, especially the meat pizza, is one of my favorites and is priced right. Fri, Oct 28, 2011 : 1:45 p.m.
Let's add this up. Two salads and, they are huge. $10. Appetizer $8. Two sodas $2.50. $20.00 + $8 + $5.= $33.00. What's the mystery? Except that you we're a little cheap on the tip. Fri, Oct 28, 2011 : 1:12 p.m.
Hope their pizza is better than the Dexter location. We have given them 3 tries and the pizza was so so..far from outstanding. Burgers are ok..nothing special.......sorry trying not to be negative. Fri, Oct 28, 2011 : 1 p.m.
"We realized after polling some of our guests that the word 'tavern' didn't exactly fit who we are or our brand," Guess I won't be going there any more, that is actually what I look for. I'll just go to the one in Depot Town. It has much more character anyway. I fear all these changes are not for the best. I'm a huge supporter of Aubree's, but.....I donno, it seems like the place started going down hill when they got rid of the wheel to spin for a free lunch and the guest bartenders. Get back to you dive bar roots!! Fri, Oct 28, 2011 : 12:36 p.m. While remodeling and name change could help this business, the core issue with this particular location is and has always been incredibly poor customer service and poorly trained staff. In the past year I have been ignored by the bartender on at least three occasions when attempting to pick up a carry out order. I had to pick up my carry out from the bar as the carry out counter was closed. No joke, on one occasion I waited at the bar for 30 minutes to pick up a chef salad and bread sticks I have also had issues of placing delivery pizza orders that just don't show up. Called this location one hour after ordering to check the status and they say the order is on the way. An hour after the second call, still no pizza. Let's not forget the joy in just trying to place a phone order at this location. It seems that their computers are always down and the employees have not grasped the concept of pen and paper to just write it down. Maybe it would help if they could text the order to the kitchen. It also seems that if someone struggles in taking an order...they are new. Someone needs to define &quot;new&quot; in the context of taking a pizza order. Seriously? Service being what it is, I will say that the food at this location is outstanding. Some of the best pizza around. I guess I should be glad the service is so bad...can you imagine how busy they would be if they had a staff who didn't ignore their customers and understood how to take an order with a computer or not. Fri, Oct 28, 2011 : 11:10 p.m. Your comments regarding poor service at this location were far too kind. Service is beyond being merely bad; it is horrible, atrocious, equal to the worst service ever reported following a trip to Paris! I am certain the only thing keeping this business operating in the black is all the middle aged horn-dogs sitting at the bar and hitting on the young waitresses. NOT a family environment! Fri, Oct 28, 2011 : 7:17 p.m. I also agree regarding the service at this Aubree's. We have been to this location about five times in the last two and a half years. The service was poor four of those times! We like Aubree's food and beers and frequent the Depot Town location not only for its character but because the service is generally excellent. We only go to the Whittaker Rd. location if the Depot Town one is too crowded or because it has been awhile and we figure we'll give it another chance. Our last experience was just a week ago. The server was pleasant enough and did get our order correct. Service was just slow and she didn't come around much. This seems to be typical of past visits. One time I had to go to the bar to get our drinks that had been waiting for the waitress to pick up and bring to us for about fifteen minutes. It is hard to believe that these two locations are owned and operated by the same people! Depot Town = great service, Whittaker Rd. = not so much. Not to mention that most of the recent times I have gone there with my family to eat, there is never enough seating and we have been told that it would be an hour and fifteen minute wait. We left and i would have a hard time returning and patronizing the business. Seems to me they have that huge seating section in the backroom that I've never seen anybody sit in. I hope they add seating and better waitstaff, too. Fri, Oct 28, 2011 : 4:52 p.m. I wholeheartedly agree. The service is the worst I have ever experienced, servers, bar and carryout (from the bar). @skotsky – it is hard not to patronize this establishment if you live in the area as there are not many choices. As seriouslyfolks stated, their pizza is good. My husband and I, on the other hand, have stopped going to and ordering from Aubrees out of sheer frustration. I would hate to see a locally owned establishment receive bad press but perhaps the feedback will alert management to the obvious customer service issues. Fri, Oct 28, 2011 : 4:42 p.m.
skotsky Just a hunch what he/she said in the last paragraph. Food is outstanding. I wouldn't condem them because of bad service. I would complain and hope they change the behavior. Fri, Oct 28, 2011 : 1:40 p.m. I think the real question would be if the service is so poor why do you still patronize Aubree's? Or, do you just like to complain? Fri, Oct 28, 2011 : 12:35 p.m.
hmmm....... they're going to miss out on halloween deliveries? next to superbowl, one of the BIGGEST &amp; BUSIEST days of the year for pizza delivery. Interesting. I hope there is nothing else going on. Aubrees and the Mexican place are the only full-service restaurants to survive that terrible shopping center's parking lot. Fri, Oct 28, 2011 : 1:41 p.m. Especially that corner of the lot. It's completely ridiculous how the traffic flow is organized. At least the &quot;back road&quot; and the new intersection are finally open. Fri, Oct 28, 2011 : 11:12 a.m.
A restaurant closes for remodeling? At least they provided a timeline. That's a good sign. Fri, Oct 28, 2011 : 10:46 a.m.
Great place to eat and socialize the French family have always been a great asset to Ypsilanti. I wish them well in their franchise adventure. It appears that Good will get &quot;better&quot;.